Did you get the new Pottery Barn catalog today? would cost if I bought everything in the catalog that was calling my name. Let's just say it is not a happening! I'm very grateful that I learned a little financial discipline somewhere along the way. You know, if I won the lottery or something. Will I get any of this? No I'm very good about things like that. Yeah, I know life isn't about things but these are pretty good things. You have to admit. You picked some good things! 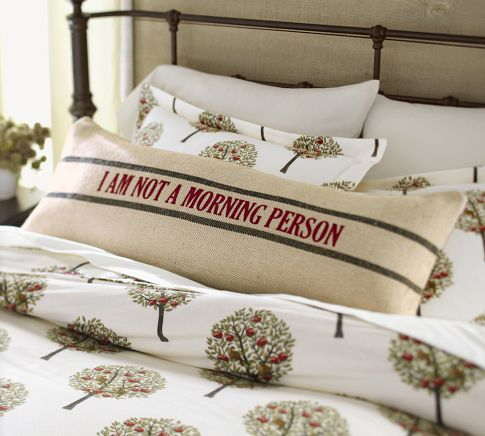 I'm really lovin' the pillow and the sign. Yep, I'm right there with ya! Oh, I hear you. I LOVE my Pottery Barn and all their wonderful inspirational photos. I have a lot of bits and pieces in my home. Their accessories are always so much fun and I love their lampshades. 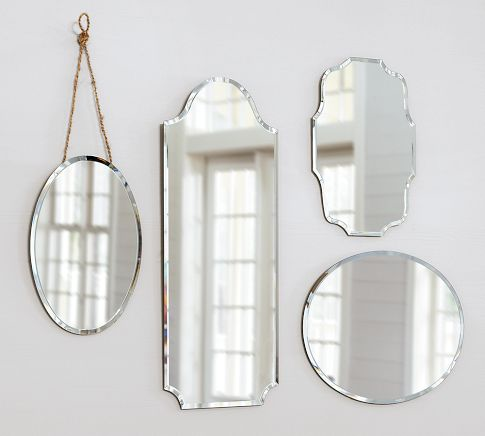 The idea for my bedroom oval mirrors were from a catalog photo from years ago. 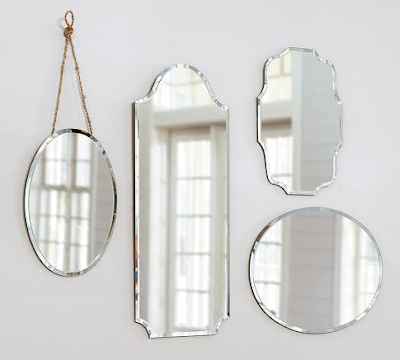 Home Depot carries the exact same mirror for about half the price. 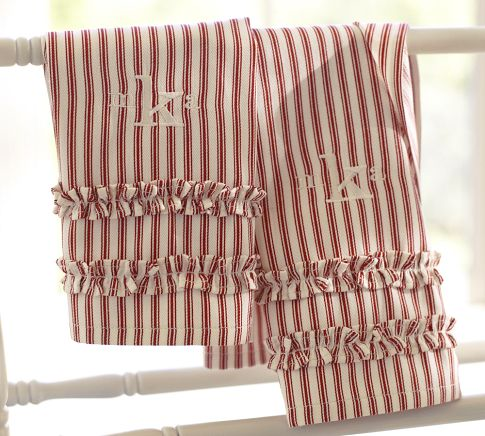 I purchased the ruffle tea towels when they were on clearance, in brown ticking stripe and made them into a small pillow for my daughter's bed. I try to avoid looking at their catalogs. I do go to their website and find things on sale that I like. 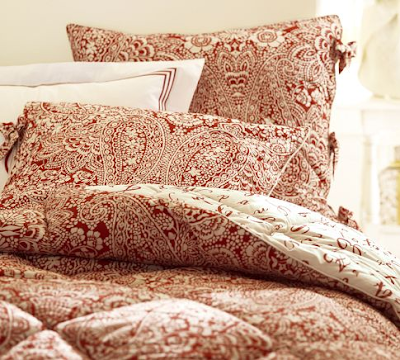 Recently a blogger posted some clearance items on sale there and they had the shams that go with my duvet on sale! That was a great moment!! And I always pick up a little something when I'm in their store! I got to go to one of the stores a couple of weeks ago and I bought one little candle holder. I wanted a lot of things...especially a pretty pillow but the prices were high! (and I haven't won the lottery yet either!) Everything was gorgeous! These are all wonderful, I can see why they caught your eye. Hard to resist PB, but then again why resist. I went into the store this weekend. Everything is a "must have"
Love, love, love it all. Like you I love cloches! 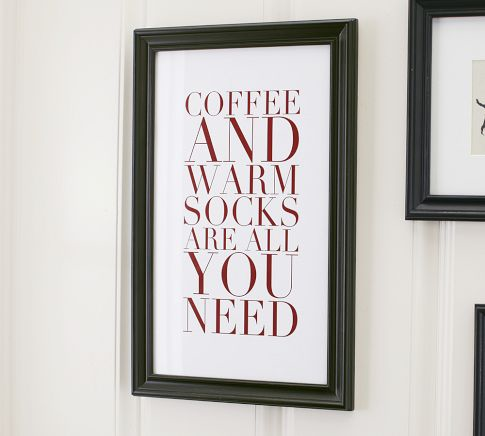 Love your's in the entryway and the vintage Hymns inside. Thanks for stopping by and liking my Autumn Porch. For some reason I've stopped getting the Pottery Barn catalogs! The is no longer any reason to go out to the mail box. It must be time for me to get something new so I can get the catalogs again. You've given me some good reasons to get shopping. Love everything you have picked out here! Oh, I agree. All great choices. I haven't got a magazine in a while. I looked on line, but it didn't list most of those beauties. I'm thinking...I could "sew" make those towels and pillow. Hmmmm. I made those little pillow ticking guest towels. They are really easy. Haha - I used to make a list from the Sears Christmas catalog as a child. Then I would add it all up and it would total about $2000! Now as adults we do it with the Pottery Barn catalog - and we still can't have everything we want! I love EvErYtHiNg in the catalog too. I like to say I have a Pottery Barn inspired home without owning anything from Pottery Barn (well maybe just a couple of things). Enjoying your blog and your newest follower. 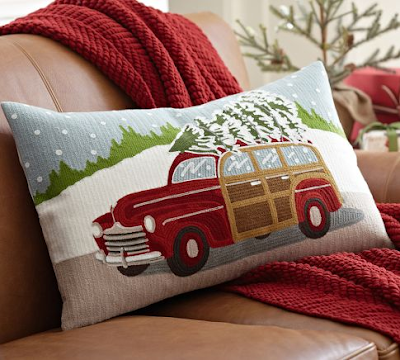 I can totally relate to your Pottery Barn dilema, and making it even worse for me, is the Pottery Barn Outlet store that is just up the road from my house. I like how you worded this post. I love the paisley sheets! My favorite! So many cute things you picked out. Good taste!! I do this too! Go through and choose the things I adore...but in reality? Maybe a *few* little items might actually appear on my doorstep. MIGHT being the operative word! But we can dream! I DID get the catalog! I stood there, held it...did NOT open it...thought about it...then threw it away.